According to the manufacturer, with The Eagle Guardian it takes only seconds to imprint the body's vibrational signature, amplify it, and send it back to the body. This new homeopathic method may well be the greatest discovery ever made to date in health care technology. 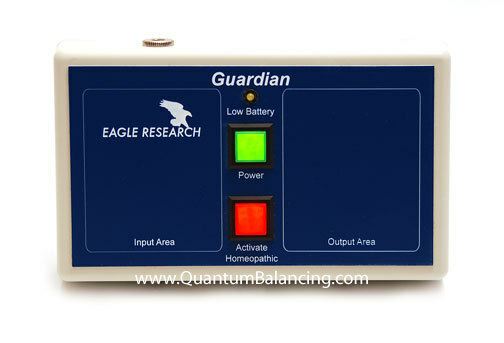 The Eagle Guardian homeopathic imprinter and potentizer provides a safe, non-invasive, profoundly effective way to restore and balance the body's bioenergetic pathways. The Guardian could restore and bring health to millions of people and is being hailed as one of the most exciting and promising discoveries in the field of bioenergetics and vibrational medicine. With this new instrument and procedure, it is possible to imprint and greatly amplify the body's vibrational signature and apply it back into the body in such a way as to stimulate restorative and healing processes. It is as if The Eagle Guardian provides the body with a clear signal /roadmap to the underlying causes of imbalance, - harmful degenerative processes, micro-organisms, parasites, toxins, deficiencies, etc. Once the body has a clear signal it can activate numerous healing processes with amazing results and positive health improvements. 1. The body's vibrational signals can be identified and imprinted over and over again, maintaining the remedy's accuracy and effectiveness. 2. A number of conditions can be treated simultaneously. 3. Nothing has to be ingested. 4. This method represents tremendous savings in time and expense.